If you need quick delivery of Sutcliffe furniture then our showroom clearance pages might be just the right place for you. This furniture in on show right now at our Burton on Trent store, and if they fit the bill for you, then you can buy them online immediately or you can call in to see them at our showrooms. A mixture of Oak and Teak ranges, with the occasional piece in medium or dark mahogany the Sutcliffe furniture ranges od Trafalgar, Windsor, Hampton, Campaign and Harewood really do offer something for everyone. If you want more images of an item, or wish to talk through your requirements then please do call us on 01283 740004 and we'd be happy to talk to you about this. If none of these items suit your requirements then please take a look at the full ranges of Parker Knoll Furniture we can supply for you by clicking here. 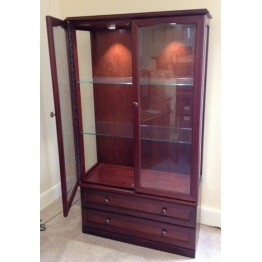 Sutcliffe 6933 Display Unit in the Windsor Light Mahogany FinishFeatures two internal LED lights t.. 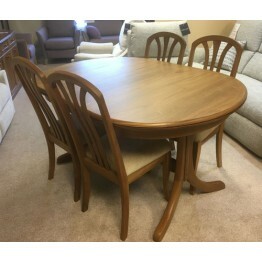 This is the light oak finish Sutcliffe Furniture Campaign table and chairs. The full dining suite co..
Sutcliffe Trafalgar Collection Dining Table and 4 Chairs.Extendable Goodwood Table and Four Arran Ch..